Arlene Dayrit lives in continuous awareness of the depths of her own brokenness—and her desperate need for God’s redemption and healing love. Although she sought to live a holy life, attending daily Mass and offering spiritual advice to others who sought her quiet wisdom, she always felt an inexplicable, inescapable hole in her heart and an inadequacy and guilt she could not ignore. Arlene struggled with feeling that God was constantly angry with or disappointed in her as she appeared to have everything together but kept trying and failing to measure up. A retreat with a wise nun changed her life: for the first time, Arlene understood the futility of her own efforts to be good and the necessity of depending on God’s grace to fill her longings and change her life. Though she finds herself broken and wretched, she has learned to let go of her view of God as a vengeful presence and to understand His loving and merciful nature, willing to forgive her transgressions and love her as she is. She has been seeking to learn more about and rest in God’s amazing, unending love ever since. When she is not working as a bank officer at one of the largest banks in the Philippines, Arlene can be found reading about and meditating on divine love and mercy. She can be reached at dayrit.arlene@yahoo.com. The Voice of Divine Love is a non-fiction religious/spiritual work written by Arlene Dayrit. The author felt broken and wretched even though she was devout and dedicated to attending daily Mass. Despite the depth of her belief, she felt that God was angry with her. At a retreat, she learned to appreciate the God who has always loved her and to understand how, in His wisdom and knowledge of her future, any obstacles to her happiness are but temporary roadblocks to her ultimate well-being. Dayrit shares her beliefs and convictions about her loving Father in this series of prose passages which can be read aloud or in silence. Each passage builds on its predecessor and the work as a whole informs the reader on the vast and caring nature of God the Father. Arlene Dayrit's non-fiction religious work, The Voice of Divine Love, is meant to be the voice of God whispering words of comfort, love and guidance, and, as I read her words, I pondered what a marvelous work this is for use in spiritual meditation. Her words flow beautifully and merge so well with the messages she seeks to convey. She includes Biblical references at times that seem to bolster the first person prose she's created, but such bolstering or support rarely seems necessary. This is an intensely personal and profound work that addresses so much and seeks to show that God is interested in every aspect of His children's lives, even the little things that happen on a day-to-day basis. He is there waiting to hear all the good things, the small disappointments, the hopes and dreams. The Voice of Divine Love is lovely and compelling, and very inspirational. If you have enjoyed books like Brad Jersak’s Children, Can You Hear Me or the music of FFH’s Voice From Home, you will appreciate The Voice of Divine Love by Arlene Dayrit. The work is a long letter from God to us. It covers subjects like: who God is, who we are in Him, how to deal with anxiety, working unto the Lord, dealing with enemies and loneliness and loss, letting go of the world, and looking toward eternity with Christ. It is mainly based on what God says about us in Scripture, but written entirely in a first person format. The Voice of Divine Love really blessed my heart. Arlene Dayrit did an exceptional job making Scripture more up close and personal. Pretty much every subject someone could want to ask God about is covered in this little book. Personally, I have been struggling with certain things in my life and “why God this and that” and He really used this to allow me to release areas to Him that I had been holding onto in an unhealthy way. Most of the letter is very loving; however, there are a few sentences here and there that come across as quite condemning, which I think are more from Arlene’s background than from God Himself. Other than a couple of sentences, The Voice of Divine Love offers a way in which people can relate to God more closely. If you know of a friend who doesn’t know what God sounds like when He talks to someone personally, give this to them as an example. Quite encouraging and very well done! The Voice of Divine Love is a unique short book written in such a way as to seem like God is speaking directly to the reader. I felt in many ways and in many parts of this book that God was speaking directly to me. The Voice of Divine Love may well be inspired by God as it spoke directly to several issues I am going through at this time. I very much enjoyed reading this in the spirit of God speaking to me. This book would be very encouraging to anyone experiencing job stress, relationship problems, low self-esteem, or severe discouragement for any reason. Also written for the evangelism of the unbeliever, this book can show how God is so loving that He will accept us if we only ask. Written from the perspective of a spirit-filled author, The Voice of Divine Love will encourage, uplift, inspire, and educate. We are often told in the Christian Community to "be still and know that I am God," and this book speaks to that mindset. We are not to be troubled about anything because God looks after every detail of our lives. He clothes the flowers and feeds the birds, and He will take care of us. He has plans and visions and purpose for our lives, and The Voice of Divine Love can help us find what those are. Coming from an Assembly of God background myself, I am very familiar with this type of writing and it is often described as prophetic. While it could be said to apply to everyone and anyone, I found direct meaning in it for me and my life and the issues that I face. I hope that Arlene Dayrit will write more of this type of book. I first read The Voice of Divine Love a few months ago and was deeply touched by its powerful message, but listening to the audio version is quite another experience. The central message of this book is that God is love — a love that is translated to compassion, tenderness, and infinite solicitude. Humanity, as well as all of creation, is the fruit of this unconditional love. Yet today’s noisy culture offers us many distractions from listening to the gentle voice that calls us from the very depths of our being, reminding us that we are loved and inviting us to find shelter and healing in that love. In this work, Arlene Dayrit, makes a beautiful offering that allows everyone who receives this message to re-define his or her spirituality in the arid avenues of today’s busy life. The book is written in the form of dialogues between the Divine and the Beloved, and the message is grounded in biblical truth. This audio book is very professionally done by readers with clear voices. The narrator, a female voice, is very articulate and the tone is high and beautiful, maintaining a pace that most listeners can adapt to. But the one speaking the part of God did an awesome job, too. The voice is soft, coming across as hypnotic and utterly inviting; it is warm and reassuring. It is wonderful how the readers allow the power of the words to come across through their voices. This book is what most people need to have in their cars, by their bedside, and in their study. Each chapter is short and contains a powerful message that showcases God’s love for the listener. Just like Life of the Beloved by Henri J.M. Nouwen, The Voice of Divine Love invites everyone to embrace their identity as the “Beloved of God,” a liberating message that offers meaning to life. Could there ever be anything superior to being loved by God? Arlene Dayrit has made listening to God very easy for most people. This book is a masterpiece with a very timely message for humankind. I loved the style, the narrator's voice and tone. But I loved the message even more. The Voice of Divine Love is a non-fiction religious/spiritual work written by Arlene Dayrit. Arlene takes us into her own journey of faith by striving toward meaningful encounters with God. In this audio version of the book, there are long passages read over soft and inviting music that does an amazing job of bringing the listener into the words and reiterating strong and powerful messages of God. This audiobook teaches us to attune our hearts to God and let go of everything that is not of God. It is told from God's perspective, speaking directly to 'you,' the listener. Arlene Dayrit's non-fiction religious audiobook, The Voice of Divine Love, is meant to represent the voice of God. In this audiobook, we have a man reading the text in a soft tone, and we really get a chance to hear just how well the text flows when spoken aloud. The words are beautiful and there is a message the author is trying to convey to us: God is great and powerful and all longing is for Him. The soft music makes it even more powerful, and there is an almost trance-like tone to the work that draws the listener in. It is as though God is whispering directly to the listener, and it was very easy to listen to. This audio version conveys the message of God positively and without affectation. The Voice of Divine Love by Arlene Dayrit is brilliant and compelling and will satisfy many listeners who want to listen to a hopeful message about God. 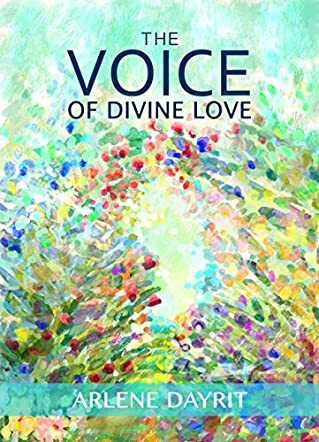 The Voice of Divine Love by Arlene Dayrit is a unique audio book narrated by the voice of God, who speaks to the listener as though right beside them. The book opens with a pleasant female voice speaking the introduction, then carries on to the voice of God in a soothing male voice that is backed by soft and relaxing music. God explains what He wants from the listener — to know their hopes and dreams. He asks the listener to call on Him and depend on Him, giving all their burdens over for complete happiness in life. The audio book touches on material items and the fact that God wants us to know that they will not last, work issues, personal struggles, and relationships. God knows there will be difficult times, but the main theme of this narrative is that God will fight battles and be beside you, even if at times it might seem like He does not hear you. All troubles have a purpose. This was the first time I’d ever listened to an audio book, and I was pleasantly surprised. I listened to the audio before bed each night, and the voice of God in the book and the beautiful music in the background were perfect for winding down from a day, and resting for the evening on a positive note. The audio was crystal clear, and I had no difficulties setting up the book or finding my place when I returned the next night. The Voice of Divine Love highlighted the importance of prayer, the power of God’s love, and the assurance that good things lie ahead for the listener. Arlene Dayrit’s purpose in composing this book was clear at the conclusion, and I truly enjoyed listening to the personal narration in God’s voice. This book is recommended to fans of inspirational literature and those who seek unique methods of connecting with religion. It would be perfect for people looking for a personal connection with God. The Voice of Divine Love by Arlene Dayrit is an audio book for devoted Christians who love to connect with God at all times. This book is written in first person narrative, making it feel like God’s voice talking to you directly and reading these words. I found that very soothing and it brought peace to my mind. I was not expecting that, but I still got it and that is wonderful. The blurb for the book says that it is the author’s prayer, but I feel like this is our prayer, collectively. We all have those times when we doubt ourselves and our worth, and we feel that we are not worthy of God’s love. God loves us all, that is an absolute truth, but sometimes we think we don’t deserve it. This audio book tells us in God’s words that He loves us unconditionally and, no matter what we do, He will always love us and forgive us for our sins. There are definitely some questions that will arise after you listen to this audio book, but you will also get all your answers from there too. This book is simple yet complex, and that just makes it much more beautiful. I found the voice to be quite comforting and peaceful. The vocabulary is simple and easy to decipher so you will not need to keep a dictionary at hand and pause, rewind, and play to learn what the word was. This is definitely a good book that should be shared with people who are feeling down or don’t have any one with them. This will remind them that God is with them at all times and we are never alone as long as He loves us.